Starting a publishing company from scratch is no easy feat – especially after battling a brain aneurysm. How did it start for you? I was a film producer for several years and then was ill for quite a while. After I recovered I decided to start helping some local artists by funding projects that would hopefully garner them some income and exposure they otherwise wouldn’t get. After I found Clayton Hanmer, he introduced me to Aaron Leighton and Steve Wilson who make up the collective Trio Magnus. We decided to make a book of their doodles and drawings which turned out to be TRIO MAGNUS: Equally Superior. I worked with Chris Hutsul as well to print his little comic called A Very Kraftwerk Summer. I then made some zines and other comics with artists like Jon Vermilyea and Michael Comeau. Aaron Leighton made the character for my logo and Koyama Press was born. I had no idea at that time that the company would be going strong five years later. Had I known, I would have chosen another name! At first I gave the proceeds of the book sales to the artists but had to change that model as it was obviously not self-sustaining. What resources did it take to start Koyama Press? Do you do most of your printing domestically or overseas? I had saved to travel for a year before I fell ill so I had a nest egg which I then added to by playing the stock market. There was no business plan as I hadn’t necessarily thought I’d be starting a publishing company. After five years, those resources are pretty much depleted. I print both overseas, in the U.S. and in Canada. What are some of your administrative influences and how have they colored your approach to running a press? I have no background in publishing whatsoever so I just started with projects and books I wanted to see out there and hoped that others would also find them interesting. I started with an art book and then discovered alternative comics. What has been the biggest hurdle or challenge for you as a publisher? Getting the books out to stores and finding wider distribution has been an ongoing challenge but it’s getting easier now. Chris Pitzer of AdHouse and Barry Matthews and Leon Avelino of Secret Acres have been extremely helpful in selling our books. Tony Shenton, Last Gasp and John Porcellino have also sold a lot of the books. The other challenge is an unexpected one. The profile of the company suggests to some a larger company than it is in reality. I constantly have people writing me who are surprised that (until this past year), it’s a one person show. You started off as a documentary film producer and you were in advertising. Can you talk about that experience, and do you see a connection between that work and, in a way, documenting and collecting artists’ stories? I had also never planned to get into the film business but I loved film production. I still love documentaries because there are so many people out there with interesting stories. You could say the same for artists and cartoonists. It’s gratifying to bring some of those stories to life. Koyama Press began in 2007, around the beginning of a huge economic recession. How did this affect your decisions as a publisher? It didn’t stop me from forging ahead with projects and books since there were countless people with whom I wanted to work. However, in 2009, two local art bookstores closed which made it really difficult to continue getting art books out there. So I decided to shift the focus more to alternative or indie comics while making fewer art books. What fostered your decision to produce pamphlet comics, and do you have a sense of how many other publishers are still working in this format? I grew up with that format of comic and still love it. There are a few publishers making this kind of book but they tend to be the micro-publishers who do small runs of books. You don’t make much by selling this kind of comic and distributors often won’t take them but I still plan to do them. Koyama Press has existed for five years now. What changes have you witnessed in comics publishing over that time? What do you make of funding platforms, like Kickstarer, as a way to fund self-publishing projects? I’ve seen the rise of several micro-publishers putting out all kinds of different work in several different formats and printing processes which is exciting. Most of the people doing this are themselves cartoonists and it’s always fascinating to me to see the kinds of work people choose to publish. I’m watching the digital book market as well. I think that it’s a really exciting time for comics right now. I have supported many Kickstarter and Indiegogo funded projects but am getting weary of them. I would pre-order a book that I was interested in but the system is a little flawed. I wish there was more accountability for one thing. I’m more interested in subscribing now to a series of comics like the fantastic Oily comics, Patrick Kyle’s Distance Mover or the Morons series by Keith Jones. That way the artist gets the funds to print up front and doesn’t have fees to pay. I could have printed a few books with what I have contributed but it was nice to spread the help around. What do you consider to be your most successful projects? There are different measures of success but my mandate is to work with mostly emerging artists so in that respect I think that every project, book or zine has raised the profile of the artist. By publishing Michael DeForge, I’ve been able to sell a lot more books which has lead to artists like Julia Wertz coming on board. It’s also very satisfying to see someone like Dustin Harbin develop over the course of his Diary Comics work. Jeremy Kai’s photography book of the underground sewers mostly under Toronto has been a big hit which was a nice surprise. As a cultural producer, do you actively seek artists that are underrepresented in comics publishing? Yes, I still look for unpublished artists in many different styles. To introduce someone like Jane Mai to a larger readership than she has online is wonderful. I also have plans to work with some more established artists as well now. The main focus of your work seems to be giving opportunities for young and emerging artists. What led to this decision and how do you seek out new work? Simply put, I saw a lot of interesting artwork mostly online and wanted to give some of those people an opportunity to get their work out to a wider audience. I go to zine fairs and look for new work at comic shows but that’s more difficult now as I am often not able to get away from tabling as much. Sometimes someone I am working with will suggest another artist’s work and I’ll check it out. What kind of work excites you? And knowing that you are very interested in the visual aesthetics of artists you choose to work with – what kinds of narratives are you drawn to? Right now I’m interested in the different ways to tell stories, I still like good autobiographical work, always love to see how people use colour. Different illustrative styles, good horror and humour. Can you characterize the comic-making energy and interest in Toronto at the moment? Do you have a sense of how that compares to other cities? I can only speak to the group of cartoonists I know but it’s as vibrant as ever. Many good cartoonists are now working in animation which is great for animation but I think it will mean a longer time between books from some of them. I think the same thing goes for other cities, lots of good work but very difficult to make a living at it full-time. What is your experience representing a small press at expos and conventions? Going to shows is a pretty intense experience, the best part is seeing artists with their fans and also seeing people discover the work for the first time. We sell a lot of books at shows so it’s a good revenue source. It’s a little overwhelming too as you want to see so many of the people you only talk to online throughout the year and can’t possibly see everyone. What can readers expect to see from Koyama Press in the future? Next year you’ll see more comics from some artists familiar and new. Also in the works are some comics for kids. 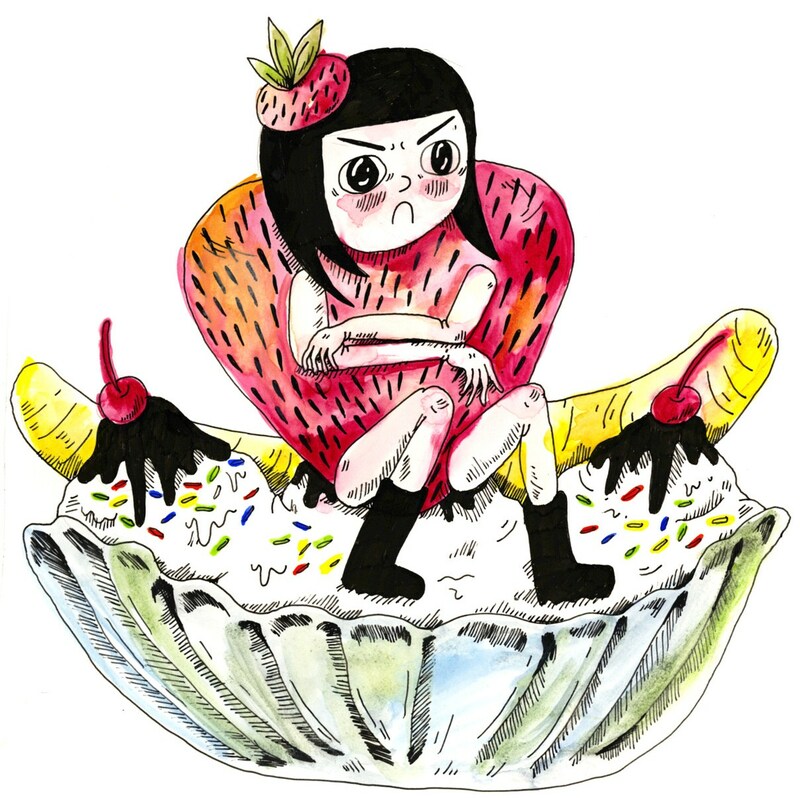 Tags: Annie Koyama, comics, independent publishing, krystal drew our first guest as a pissed banana sunday with sprinkles, really nice people. Bookmark the permalink. Thank for the great interview! Koyama Press is publishing some of my favorite comics these days.